Gov. Gary Herbert is pleading Utah teachers to stay in their classrooms and for those who have left to come back. The statewide shortage of educators, he said, is dire. And a big part of that, he suggested, is low salaries. In Utah, 47 percent of new teachers leave the profession after five years in the classroom, according to a joint study from the Utah State Board of Education and the Utah Education Policy Center. After seven years, it’s 56 percent. “We need to address what we can do about that,” Herbert said. 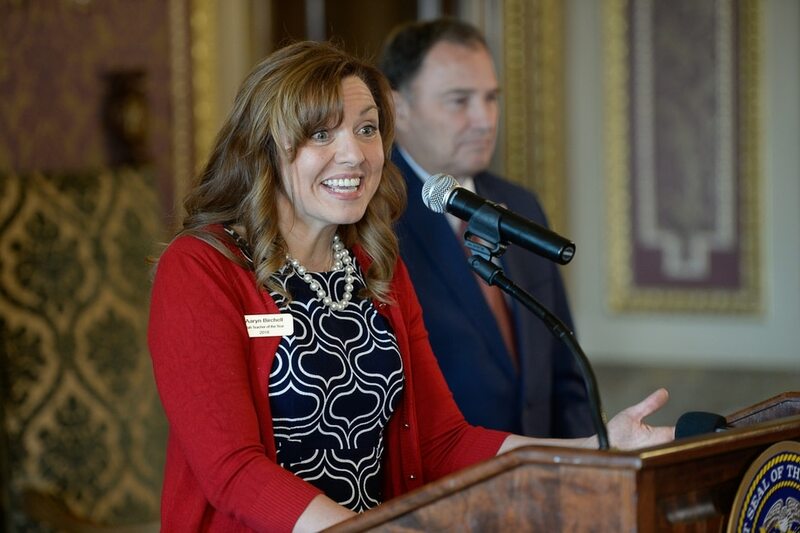 He was joined Wednesday by Sydnee Dickson, state superintendent of public instruction, and Aaryn Birchell, 2018 Utah Teacher of the Year. About five years ago, Birchell said, she considered leaving teaching due to stress and burnout. She spent her Saturdays grading papers. She constantly worried about her students’ individual needs and at-home challenges. And she wondered if she could do this for the next 20 years. “You want to fix it all,” she said. Birchell, who teaches English at Uintah High School in Vernal, decided to push through and has been happy she has. That doesn’t mean, though, that she hasn’t seen others make a different decision. In just her team of three sophomore English teachers at Uintah, an educator has left and a new one has switched in every year since Birchell started there 10 years ago. To get more people to stay in the classroom, she believes, there needs to be better support systems in schools and districts, less pressure on teachers to work off-hours and more respect for the profession overall. “If we take care of the teachers, the teachers are going to take care of our kids,” she said. Birchell is also a member of a statewide task force created four years ago to study the teacher shortage in Utah. The group has conducted polling that found 89 percent of state residents say educators should be paid better. The committee is now soliciting responses to a questionnaire — at returntoteaching.org — to find out why teachers in Utah have left and what might incentivize them to come back. Dickson, the state superintendent, agreed with Herbert on Wednesday that better salaries could be the key to improving retention and morale — and recruiting more teachers. Some of the districts along the Wasatch Front had “salary wars” last summer that she hopes will help. But the state, too, she believes, needs to fund some of that boost in compensation. (Francisco Kjolseth | The Salt Lake Tribune) Aaryn Birchell, 2017-2018 Utah Teacher of the Year, is joined by Governor Gary Herbert at the Utah Capitol as they discuss UtahÕs teacher shortage and issue a call for more teachers during a press event on Wed. Sept. 12, 2018. 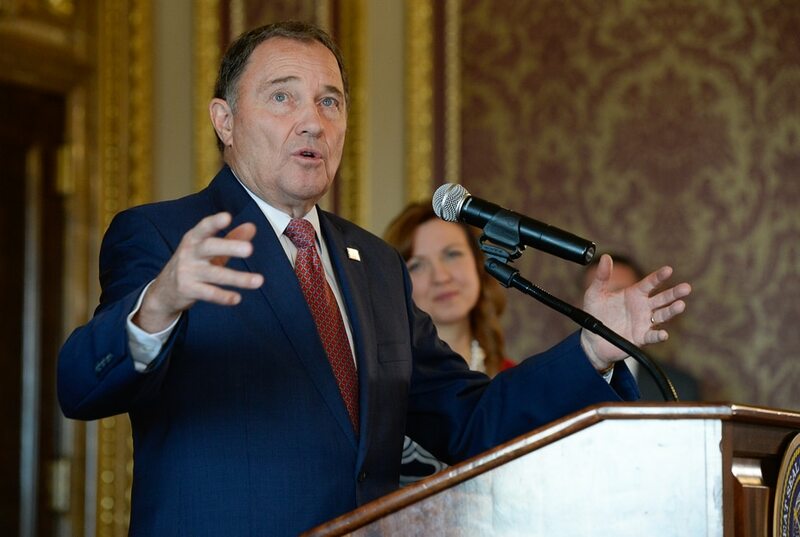 (Francisco Kjolseth | The Salt Lake Tribune) Governor Gary Herbert makes his plea consider becoming a teacher, it's a noble profession, as he is joined by Aaryn Birchell, 2017-2018 Utah Teacher of the Year, in background, and other education leaders at the Utah Capitol to discuss UtahÕs teacher shortage during a press event on Wed. Sept. 12, 2018. (Francisco Kjolseth | The Salt Lake Tribune) Aaryn Birchell, 2017-2018 Utah Teacher of the Year, center, is joined by Sydnee Dickson, State Superintendent of Public Instruction and Governor Gary Herbert at the Utah Capitol as they discuss UtahÕs teacher shortage and issue a call for more teachers during a press event on Wed. Sept. 12, 2018. (Francisco Kjolseth | The Salt Lake Tribune) Sydnee Dickson, State Superintendent of Public Instruction is joined by Governor Gary Herbert and Aaryn Birchell, 2017-2018 Utah Teacher of the Year as education leaders discuss UtahÕs teacher shortage and issue a call for more teachers during a press event at the Utah Capitol on Wed. Sept. 12, 2018. (Francisco Kjolseth | The Salt Lake Tribune) Aaryn Birchell, 2017-2018 Utah Teacher of the Year, is joined by Governor Gary Herbert at the Utah Capitol as they discuss UtahÕs teacher shortage and issue a call for more teachers during a press event on Wed. Sept. 12, 2018. “Teachers matter and they matter a lot and we don’t have enough,” Dickson said. Herbert said education is his “No. 1 budget priority” this year. But some extra funding, he suggested, could come through the Our Schools Now ballot question. It asks Utahns whether they support a 10-cent-per-gallon gas-tax increase that would allow more funding to be shifted to schools. If the tax wins support, the Legislature is expected to transfer more than $100 million each year from transportation directly to districts to hire more teachers or buy supplies. 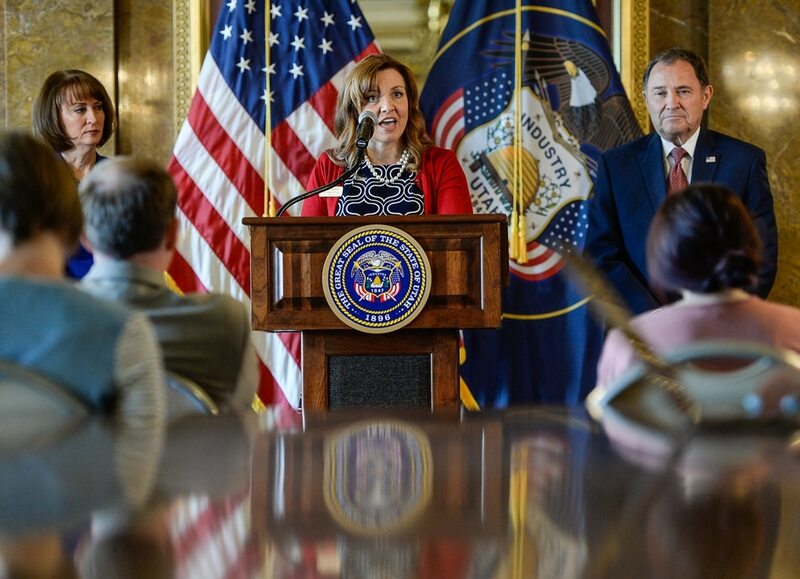 Utah has long ranked at the bottom in the nation for per-pupil spending, the governor acknowledged, and this could “help us make the nudge” to change that while also supporting teachers.